As we go about our daily routine, our inner voice is constantly interpreting our experiences and interactions with others. It’s that voice in your head that’s always commenting on your situation, coming up with ideas, and questioning your decisions. Psychologists call this inner voice your self-talk. Your self-talk is a mixture of your conscious thoughts and your core beliefs. Sometimes your self-talk is happy and sends you positive messages. Then there are times when your self-talk is negative and self-defeating. Instead of your inner voice being an ally, it becomes your inner critic. It judges you, criticizes you, and doubts you. It constantly tells you that you are not good enough, compares you to others, and focuses on our flaws. It says hurtful things like, I’m stupid, I’m a loser, I am a failure, I won’t succeed in life. Overtime this barrage of constant negativity erodes your self-esteem and self-confidence. The first step is for children to become aware of all the negative things they say to themselves. Many times their negative self-talk is on autopilot and they don’t even notice how critical they are being of themselves. However, since thoughts create feelings, when children experience negative emotions such as anger, anxiety, sadness, etc, typically this is an indication that negative thoughts are corrupting their minds. Their negative emotions is a signal for them to stop and become aware of their thoughts. Keeping a thought record or thought log is a great way for kids to monitor their negative self-talk. Tracking their thoughts brings into awareness the negative thinking that’s preventing them from being happy and successful. Children can keep track of their negative thoughts with a daily thought recording log similar to the one below. 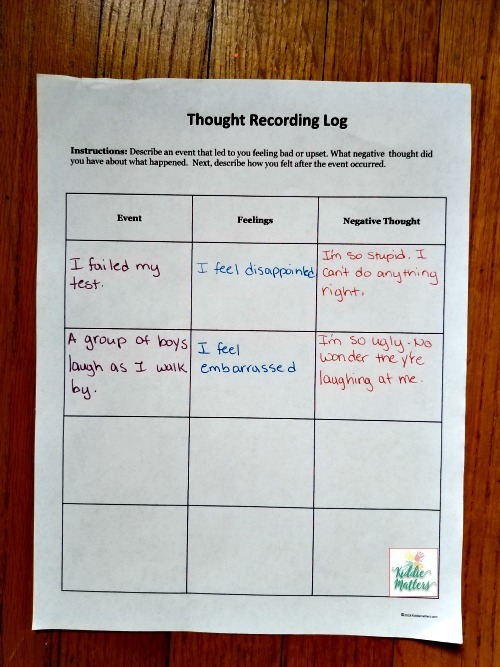 The thought recording log gives children insight into what limiting beliefs are causing them to self-sabotage. They can use this information to come up with a plan to change how they see and define themselves. Children often accept their self-talk as truth and never question anything it says. If they hear you’re a loser from their inner voice, they tend to believe that message and feel like a loser. Overtime, this leads many children to develop low self-esteem and a negative self-image. Therefore, it’s not enough for kids to only recognize their negative self-talk. Once they start noticing their negative thoughts, they also need to learn how to challenge their stinking thinking. For example, if they notice they frequently tell themselves I am stupid, have them ask themselves, is this true? Am I stupid? Have there been times when I’ve demonstrated that I’m smart? When children ask questions to challenge their negative self-talk, they get to determine if their thoughts make sense and if they are accurate. It also gives them a chance to explore different ways they might interpret a given situation. Additionally, they learn to not accept every thought they have as fact without first gathering evidence. Negative Self-talk: No one likes me. Positive Re-frame: This statement isn’t true. My family likes me and I have friends that also care about me. There are some people who don’t like me and that’s OK. I don’t have to be liked by everyone. Negative Self-talk: I can’t do anything right. Positive Re-frame: I’m really good at doing some things and there are other things I don’t know how to do well just yet. If I want to get better at those things, I can always practice so I can improve. Negative Self-talk: I know I’m going to fail my test. Positive Re-frame: I actually don’t know if I’m going to fail my test, I’m just assuming that I will. All I can do is study so I can do my best. It’s OK that I feel anxious, but I can cope with my anxiety by being prepared. This technique isn’t about trying to stop the negative thought. 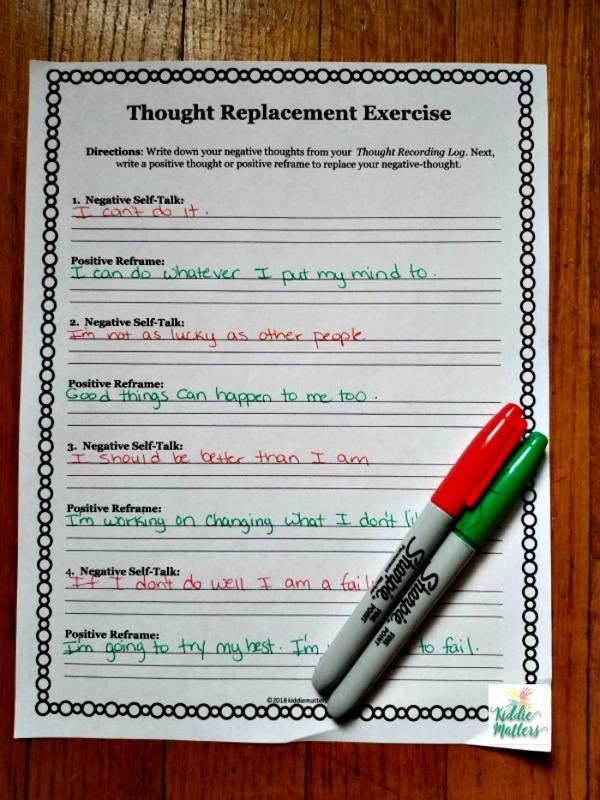 It’s about bringing the negative thought into awareness so kids can replace negative self-statements with more positive ones. Have children wear a rubber band on their wrist. Instruct them to snap the rubber band on their wrist anytime they find themselves feeling anxious, sad, angry, and/or depressed. After snapping the rubber band, children need to pause and question the validity of their thoughts. 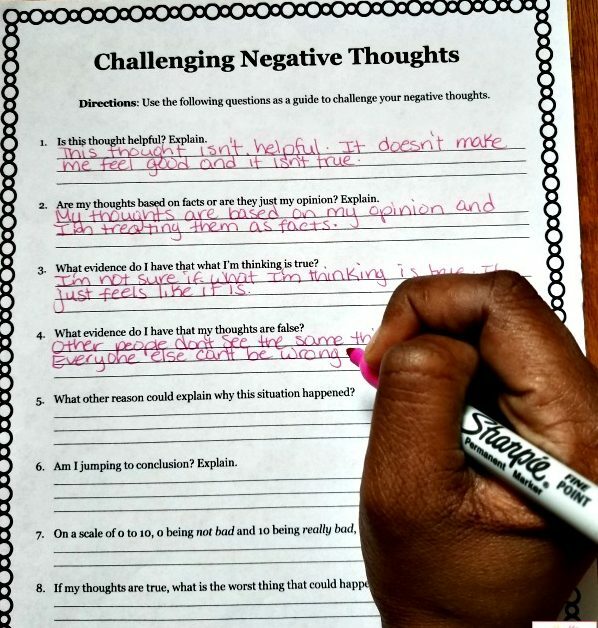 Next, they can use a positive statement from the list they created in Step 3 to replace the negative thoughts they are thinking. Most of us are familiar with creating music playlists for our entertainment. When a song comes on that we don’t like on our playlist, we skip it and look for something else we prefer. In this exercise, children are asked to treat their self-talk like a playlist they have running in their brain. 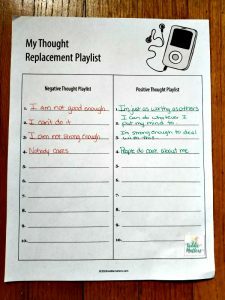 Have children complete the My Thought Replacement Playlist worksheet. Instruct them to press the left side of their head when a negative thought from their playlist starts playing. This ‘pauses’ the negative thought. Now they can challenge the thought and decide if it’s true or not. 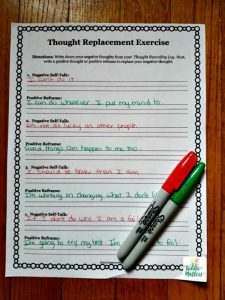 If the thought isn’t realistic or helpful, then they can press the right side of their head to start playing a new thought from their positive thought playlist.